‘Who was colonial education for?’ Rebecca Swartz asks, in her new book about education across the British Empire, from South Africa to Western Australia. I have recently come to the end of what feels like a long journey, beginning with the research I pursued during my Masters thesis at the University of Cape Town in 2011. While researching histories of higher education in South Africa, I became aware of the degree to which it was shaped by the idea that education was essentially good for all who encountered it. These histories also tended to focus on South Africa in isolation, implying that increased education provision was the sign of South Africa’s transition toward modernity. Surely there was more to this story, both in the context of South Africa and further afield? With these issues in mind, I began my Ph.D. in 2012, determined to widen the scope of the histories of colonial education by bringing together case studies from a number of different colonial contexts. 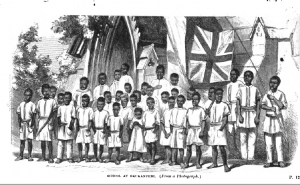 A focus on the education of Indigenous children in the British Empire would not only contribute to South African historiography, but also to broader British imperial historiographies. The latter have tended not to focus on education in its own right. I initially opted to focus on the period between responsible government and Federation in Australia (1901) and Union in South Africa (1910), choosing Natal, a British South African colony now known as the province of KwaZulu-Natal, and Western Australia as my primary case studies. Imperial Federation, Map of the World Showing the Extent of the British Empire in 1886, by J. Colomb (1886). Image via Norman B. Leventhal Map Center Collection, Boston Public Library. These places stood out as two settler colonies where responsible government was significantly delayed – until the 1890s in both places – because of imperial government concerns over the treatment of Indigenous people, as Ann Curthoys and Jeremy Martens have shown. When examining the debates that surfaced in the 1880s and 1890s regarding the status and treatment of Indigenous people in each colony, I was struck by how vociferously settlers defended their status in each colony by turning to the language of race. As historian Julie Evans has argued, race was a defining category for access to equality in both places.I was interested in exploring the implications of this discourse with respect to the education of Indigenous children. However, as is so often the case, the research process led me down a slightly different path: it soon became clear to me that in order to understand the particular circumstances of these two locations, I needed to look for the origins of educational policies and practices earlier in the nineteenth century. I therefore shifted my focus, beginning by examining debates about education in metropolitan and various colonial contexts in the period after slave emancipation throughout the British Empire in 1833. The decades after slave emancipation in the British colonies saw increased government involvement in education, although this was often carried out in a partial and hesitant way. Increasingly, education was seen as the responsibility of a humanitarian colonial government. In the 1830s and 1840s, the ‘moral and religious’ education of children was posed as a way of ameliorating the condition of Indigenous people and communities. In reality, however, education was used as a way to divide people, often according to race. My book, Education and Empire: Children, Race and Humanitarianism in the British settler colonies, 1833-1880, recently published by Palgrave Macmillan, argues that the relationships between labour, class, race, gender and education that shaped education in the British settler colonies were profoundly influenced by the context of slave emancipation. When slaves were freed in the British West Indian colonies, the imperial government voted to fund government education for the children of freed people, in order to ‘prepare’ them for freedom. This form of education, initially focused on reading and writing, eventually gave way to a far more labour-intensive curriculum, which would ultimately train previously enslaved people for a life of servitude. The ideas about education for labour, so clearly articulated in the West Indian context, were not unique to that location. In Western Australia, for example, colonial officials and some missionaries agreed that training children to be servants in local Perth settler homes was the best means of inculcating ‘civilisation’ for Aboriginal children. Over the course of the nineteenth century, local colonial officials in Natal also came to favour ‘industrial’ education for black African students. As the century progressed, this form of education – which promoted manual skills over literary training – came to be seen as peculiarly adapted to the different abilities of the races. Thus, education was based on perceived racial differences but also used as a way to entrench racial difference. In essence, different access to education came to confirm spurious beliefs about the intellectual capacities of different groups of people. What became clear during the course of my research was that the very concept of education was in constant flux during the nineteenth century, and indeed, remains subject to negotiation today. Education was often conceived of as both immensely narrow as well as far-ranging and broad, from curriculum and work done in the classroom to the intangible meanings of civilisation, increasingly seen as impossible to teach. The Ekukhanyeni school, Natal colony. Bishop John Colenso, First Steps of the Zulu Mission (London: Society for the Propagation of the Gospel in Foreign Parts, 1860). Its intent was also deeply gendered: girls were trained to be good wives and mothers, through learning to sew, cook and clean. Boys, for their part, were taught a variety of manual or industrial skills, including farming, brickmaking, basket-weaving and masonry, depending on their location and the particular abilities of local teachers and missionaries. Education was seen as a way to create Christian families in which men were the household heads, working outside of the home, while women focused on childrearing. Ironically, in the South African context, boys were often less likely to be educated than girls, as their labour – particularly as herders – was more urgently needed than that of their female counterparts. Government funding for education in metropolitan Britain only took off at the same time as similar funding was being offered to the colonies. 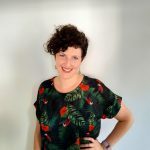 The approach of my book is to highlight the connections and divergences between the educational practices of the two settler colonial contexts that I focus on, Natal and Western Australia, while keeping in mind that the metropolitan context was also being shaped by radical educational change. This extended to ideas about the role of the state in the life of the family, as compulsory education became more acceptable as the century progressed, and indeed, was more often seen as a government responsibility to its citizens. 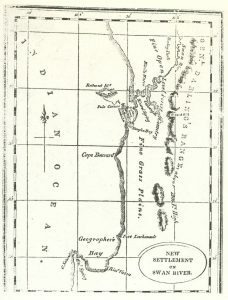 Early map of swan river colony, Western Australia. Image via Wikimedia Commons. This focus on colonial education allowed me a way into thinking about the construction of difference in the settler colonies, not only in terms of race, class and gender – although these were of course significant lines of demarcation – but also in terms of age. Concepts of childhood itself shifted rapidly during the nineteenth century. Childhood came to be seen as a time for children to be protected, as evidenced in changing attitudes toward child labour. In the settler colonies, however, ideas about who counted as a child collided with increasingly rigid ideas about race, which positioned adult Indigenous people as either childlike or children themselves. This meant that their own children’s education was increasingly seen in pessimistic terms. By the time I completed this project, the driving question behind my initial interest in the area was at least partially answered – more education certainly did not mean more progress or better outcomes for Indigenous people in the colonies of settlement. 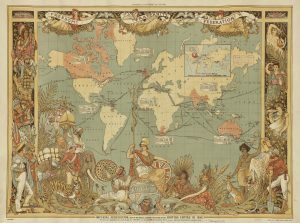 Rather, what has become clear is that studying histories of colonial education is an important way into understanding the multiple meanings of difference in colonial contexts. My book’s major contribution is to bring different sites of encounter – the Cape, Natal, Western Australia, New Zealand, and the West Indies – together with scales of analysis ranging from individual relationships between adults and children in schools to broad Empire-wide studies of education, like that conducted by nurse and statistician, Florence Nightingale, in 1863. In doing so, Education and Empireshows no linear pattern in education provision in the colonies, but rather illuminates a set of guiding principles regarding the meanings of civilisation, education and race that informed diverse educational practices. Prior to my book appearing in January 2019, South Africa had witnessed a renewed focus on the relationship between education, colonialism and decolonization, inspired by student protests under the banner of the #RhodesMustFall and #FeesMustFall Movements. This activism has since sparked similar discussions elsewhere. Although these debates are not the focus of the book, my hope is that it will contribute a nuanced understanding of just how education was used to entrench racial difference in the nineteenth century. The legacies of these policies are certainly still being grappled with today. 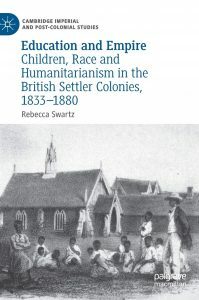 Rebecca Swartz is a historian of British imperialism in the nineteenth century, focusing on the intersections between childhood, race, and humanitarianism. After completing her PhD at Royal Holloway, University of London, in 2015, she returned to South Africa and has completed postdoctoral research fellowships at the Universities of Cape Town and Stellenbosch. She is currently a postdoctoral research fellow in the International Studies group at the University of the Free State, where she is working on childhood, freedom and migration in the post-emancipation Cape colony. Follow Rebecca on Twitter @HistosaurusBex. This entry was posted in Book launch, Research blogs. Bookmark the permalink.